The “clean energy economy” is yet to experience a steady growth as it always seems to be a few steps away but never quite here. Fossil fuel inputs are still used to deliver most energy for heating and cooling, transportation and manufacturing. However, with a few scientific advances, hydrogen, considered to be the most abundant element in the whole universe, could be the energy carrier of a future clean energy society. Moving a step closer in achieving the elusive goal, scientists from Penn State and Florida State University have developed a cost-effective and industrially scalable catalyst to produce pure hydrogen via a low-energy water-splitting process. Energy is the most important issue of our time, and for energy, fuels cells are crucially important. And then for fuel cells, hydrogen is most important. 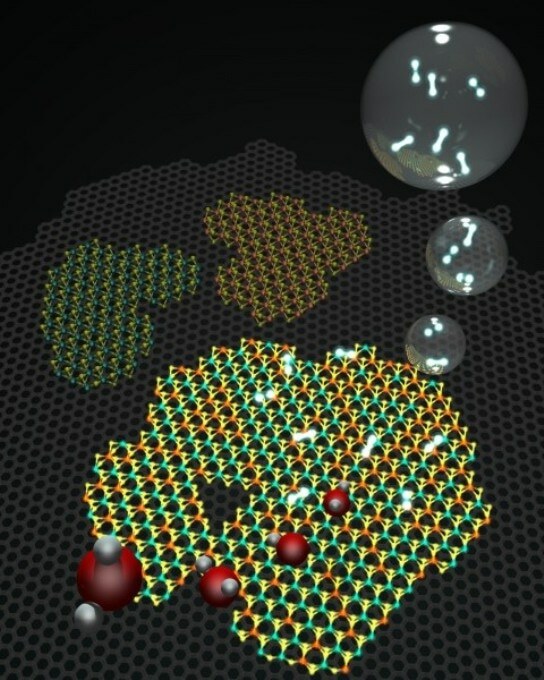 People have been searching for a good catalyst that can efficiently split water into hydrogen and oxygen. During this process, there will be no side products that are not environmentally friendly. The industrial method currently used for producing hydrogen – steam reforming of methane – results in the discharge of CO2 into the atmosphere. Other methods make use of waste heat, such as from improved nuclear power plants, or concentrated solar power, both of which experience technical challenges while striving to become commercially feasible. In another industrial process, platinum is used as the catalyst to drive the water-splitting process. Platinum is expensive even though it is a near-perfect catalyst. Hydrogen could thus be a cheaper catalyst as it is a reasonable alternative to fossil fuels in transportation, and power fuel cells for various energy storage applications. Molybdenum disulfide (MoS2) has been predicted as a possible replacement for platinum, because the Gibbs free energy for hydrogen absorption is close to zero. Less external energy will have to be applied in order to produce a chemical reaction when the Gibbs free energy is much lower. However, using MoS2 as a catalyst has its own disadvantages experimentally. MoS2 is a semiconductor in its stable phase, limiting its potential to conduct electrons. To overcome this issue, the researchers added reduced graphene oxide, which is considered to be a highly conducting form of carbon. To further decrease the free energy, the team then alloyed the MoS2 with tungsten to produce a thin film with alternating graphene and tungsten-molybdenum disulfide layers. The addition of tungsten reduces the electrical voltage needed to split water by half, from 200 millivolts with pure MoS2, to 96 millivolts with the tungsten-molybdenum alloy. The water splitting process uses an extremely small quantity of electrical energy applied to an electrode that is immersed in water. With this small potential, it is possible for the protons in the solution to be absorbed onto the surface of the catalyst. This is followed by the migration of two protons together in order to develop a hydrogen bubble capable of rising to the surface and releasing the hydrogen. The electron orbitals play a vital role from the theoretical point of view. In the case of pure MoS2, the orbitals from the metal fail to overlap well with the orbital of hydrogen in the crucial reaction step; however, these orbitals interact well when the alloy is present, increasing the efficiency of the reaction. This indeed is similar to what platinum does, and it is also the reason for platinum to be so energy efficient at this chemical reaction. However, in this research, the team demonstrated that more abundant and cheaper elements can be used to obtain an efficiency that outperforms all the catalysts considered to be the best. What happens in these alloys is an exquisite overlap of orbitals which makes the reaction more efficient. This is not observed in the pure components. It is an example where the hybrid is better than the pure components. Jose L. Mendoza-Cortes, Professor of Chemical Engineering, Materials Science and Engineering and Scientific Computing, Florida State. Hydrogen fuel cells are capable of boosting a clean energy economy in the transportation sector, where fast fueling and vehicle range outpace vehicles that are battery powered. These fuel cells can also store electrical energy generated by wind and solar. This research is another step towards achieving that goal. In addition to Lei, Terrones and Mendoza-Cortes, others contributing to the ACS Nano paper, titled “Low Temperature Synthesis of Heterostructures of Transition Metal Dichalcogenide Alloys (Wx Mo1-xS2)and Graphene with Superior Catalytic Performance for Hydrogen Evolution,” are Kazunori Fujisawa, Chanjing Zhou, Nestor Perea Lopez, Ana Laura Elias, Lakshmy Pulickal Rajukumar, Bernd Kabius and Nasim Alem, Penn State; Srimanta Pakhira and Oluwagbenga Oare Iyiola, Florida State; Xuyang Wang and Ruitao Lv, Tsinghua University, China; Morinobu Endo, Shinshu University, Japan. The U.S. Army Research Office, the National Science Foundation, and national funding agencies in China supported this work.